The new Ford Mondeo Diesel Hatchback is never going to be as popular as it was in the 1990s. That was an era when “Mondeo Man” was a thing and SUVs didn’t exist. Still, there’s no denying that the brand new model is the best yet. It looks gorgeous and confident, offers a comfortable and refined driving experience and boasts lots of interior space. If you would like to find out more about Ford then read our brief history of Ford article. If you were a Mondeo Man back in the nineties, or if you’re just curious to see how the new model stacks up, join OSV as we take a closer look at what it’s all about with our 2018 Ford Mondeo Diesel Hatchback review. The Mondeo used to be the most fun car to drive of its type, but while it’s still good to drive, it’s not as entertaining as it once was. In fact, it feels a lot more grown up, with Ford shifting the focus to comfort and relaxation. Its steering is lighter and faster than it used to be, but Ford have taken away some of its communication. As a result, you won’t want to chuck it into bends with as much confidence as you would have done in the nineties. Ford have tweaked its suspension setup, too. It’s arguably more comfortable than its predecessor, but there’s now more body lean in corners. All in all, if you want the last word in driving fun from a family car, the Mondeo is no longer the one to go for. In terms of its engines, a 2.0-litre 178bhp diesel has a 0-62 time of 8.3 seconds, which sounds good on paper. The problem is that, in reality, it never actually feels as fast as all that. It’s also a tad inflexible and occasionally stalls if you don’t get the shift up to second gear right. A 2.0-litre bi-turbo diesel that develops 207bhp is a good shout. It’s the fastest in the range with a 0-62 time of 7.9 seconds, and driving it is a very smooth and effortless experience. It makes a bit of noise at first, but once it settles down on the motorway it’s quieter than all the other diesel engines. Meanwhile, a 1.5-litre TDCi diesel sits at the bottom of the range. But with just 118bhp under its belt, we think it’s going to be too underpowered for most buyers. Also available is a 148bhp variant of the 2.0-litre engine that’s easier to recommend. It might be less powerful than the 178bhp variant, but because that one doesn’t feel so fast and isn’t as cheap to run, the 148bhp looks appealing. The new Mondeo boasts good build quality, and insulation is good. Both inside and outside, the Mondeo looks far better – and more commanding – than last time, with the brand attempting to give it a more upmarket image. To a large extent, it’s worked. That said, if you want your Mondeo to be as premium as possible, you’ll need to splash out on the Vignale trim. Other than that, all models feel more luxurious than ever, and the cabin is refined and comfortable. The Mondeo has never been quieter, and it suits the car’s newfound relaxed nature. 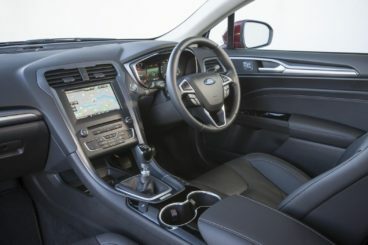 New rectangular air vents have replaced the old circular ones, and Ford have added a brand new 8” infotainment screen that controls the SYNC3 voice recognition system. A sat-nav is also available, and whilst it will take some getting used to, it works well once you’re up to speed. Is the Ford Mondeo Diesel Hatchback practical? It’s bigger than last time, and head and legroom in the rear is impressive. Space up front is fine too, but if you want to maximise practicality you’ll need to go for the Titanium model, which comes with a 10-way adjustable heated electric driver’s seat. A panoramic sunroof is well worth adding if you want the cabin to look even bigger, wide opening doors make access easy, but the rear screen is a bit awkward in that it restricts visibility. The boot, meanwhile, measures 550-litres, which is an improvement of 22-litres on its predecessor. Fold the rear seats and you can extend it to 1,466-litres. The Zetec trim is now the entry-level model. It comes with the brand’s SYNC3 voice recognition system and an 8” infotainment screen, as well as 17” alloys, a heated windscreen, front and rear parking sensors, a digital radio, cruise control, an alarm and climate control. The Titanium model adds 18” alloys, traffic sign recognition, lane keeping assistance, heated seats, ambient interior lighting and automatic lights and wipers. The ST Line is the sportier version of the Mondeo and it rounds the range off with a racy body kit, sport seats, black interior trims, lowered suspension and a leather steering wheel. In terms of how safe the car is, the Mondeo was awarded all five stars for its crash test performance by Euro NCAP. However, many of its advanced safety technologies are missing from the Zetec model. To get the likes of traffic sign recognition, lane-keeping assistance, adaptive cruise control and Active City Stop autonomous emergency braking, you’ll need to pay extra. If you want to find out more about Ford reliability read our honest assessment of the manufacturer here. Prices for the new car start out from £20,695 and rise to £31,195. For more information on our leasing deals, you can check out our page here. In terms of its running costs, the 1.5-litre diesel is the most frugal in the range. It can return a very impressive 78.5mpg on a good day and emits a mere 94g/km of CO2 if you opt for the ECOnetic fuel-saving tech. The 148bhp 2.0-litre diesel, meanwhile, can manage returns of 68.9mpg and emits 107g/km, while the bigger 178bhp variant of the same engine is good for 64.2mpg at best. It emits 115g/km of CO2. These are all really good figures but if you splash out on the range-topping Vignale trim, you’ll be looking at 59mpg economy and emissions of 124g/km. The Mondeo always scrubbed up well, but it’s matured as it’s got older. Stick to the smallest diesel and you can return over 78mpg on a good day. That’s fine in towns but can pose problems on the open road. It’s not even that it’s a huge car – but it feels that way. 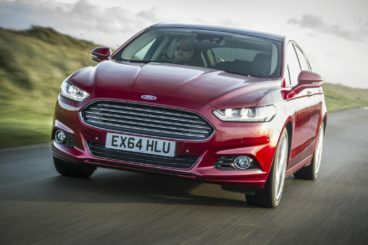 Let’s see how the car fares against its rivals in the comparison section of our 2018 Ford Mondeo Diesel Hatchback. The new Skoda Superb has a name that suggests Skoda clearly think a lot about it – and as well they might. It’s spacious, comfortable and looks stunning. The problem for the Mondeo is that it’s been away for so long that cars like this have caught it up – and bettered it. It doesn’t drive like a sports car, but the amount of comfort, relaxation and pure sophistication on offer makes it feel like the large exec saloon it wants to be. It’s smooth, it’s quiet and it covers long distances with ease. Front-wheel-drive is standard on most models but four-wheel-drive can be specified. In terms of the engines, we’re a big fan of the petrols and they’re destined to be the biggest sellers. They’re hushed and smooth, and if you’re a low mileage driver they make perfect sense. However, that doesn’t mean the diesels should be discounted. They’re nowhere near as noisy as they used to be and will work well for longer mileage drivers. Our top pick is the 2.0-litre 148bhp diesel as it has a good blend of economy and performance. Driving it is pretty effortless. On the other hand, the 118bhp GreenLine model is going to attract buyers for whom running costs are a priority. It returns 76.4mpg and emits 95g/km of CO2 – incredible numbers for a car like this. 118bhp, though, will make it too underpowered for many. Inside, the Skoda team have gone for an understated design that’s tasteful and easy on the eye. It’s nothing special, but this is a cabin that’s really well-built, modern and user-friendly. We like how everything is arranged in a logical fashion, and we have no complaints about the quality of the materials used. 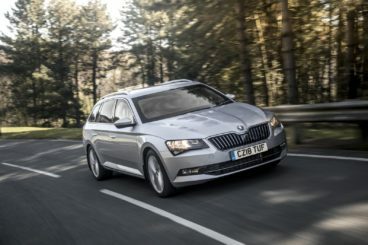 Is the Skoda Superb practical? It’s vast inside, which is the first thing you’ll notice as you climb aboard. Skoda have even increased its dimensions from last time, and rear seated passengers are arguably treated better than those upfront! Big doors are great for easy access, the steering wheel and driver’s seat offer a good amount of adjustability and there are the usual clever practical touches from Skoda, including a light in the boot which also works as a rechargeable torch. The boot itself, meanwhile, measures 625-litres, which represents a 30-litre increase on the old model. 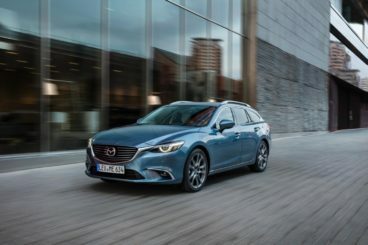 The new Mazda 6 Diesel Hatchback has taken the Mondeo’s crown as the best car to drive in this class. It also looks good and boasts affordable running costs. Where the Ford has lost some of its handling prowess, the Mazda has gained some. As far as family saloon’s go, this is the most fun you can have without spending big on a BMW. It’s just as agile as the zippy Mazda MX5 Roadster, and the gearbox, pedals and steering are all superbly weighed. If we can have one criticism, it’s that the ride is a tad on the firm side. Keep the car on smoother surfaces, though, and you’ll have a ball. In terms of its engines, there’s just one diesel available but it’s offered in two separate power guises. This is a 2.2-litre diesel that’s the highlight in the Mazda 6 range. The smaller of the two develops 148bhp and can complete the 0-62 dash in 9.1 seconds, while the bigger of the two – which is only available with the Sport model – develops 173bhp and completes the same sprint in 7.9 seconds. Mazda have introduced a balancing system for the engines this time around, and they ensure that the diesels are a lot quieter than last time. Running costs? The smaller of the two diesels emits 107g/km of CO2 and returns around 65.6mpg economy. The bigger variant is affordable to run too and can return 62.8mpg on a good day while emitting 119g/km. Inside, the cabin is smart and spacious and one of the best in this class. It’s stylishly designed, there are touches of luxury here and there – such as lashings of chrome – and the supportive seats offer lots of comfort. The dashboard is robust and functional, but it also feels upmarket, thanks to a leather trim. It’s just a shame that the leather steering wheel will probably become shiny over time. Is the Mazda 6 Diesel Hatchback practical? It’s actually a bit less practical than last time, and this is because Mazda have chosen to make it so stylish. It’s essentially a four-door-saloon that has some practicality, but you’ll need to be prepared to make a few sacrifices. For one thing, it isn’t easy to park. For another, the sloping roofline means that rear headroom isn’t as good as it is in rivals. Moreover, the boot has shrunk from 500-litres to 483. Still, visibility is good and there are lots of storage solutions dotted around the place. Ford have made a few changes to the new Mondeo. It’s still good to drive but it’s no longer the sharpest car in this sector, with Ford shifting focus to comfort and refinement. It looks better than ever and feels classier. All in all, the Ford Mondeo Diesel Hatchback has matured and grown up – and we’re quite taken with it.